Product prices and availability are accurate as of 2017-10-05 06:12:47 EDT and are subject to change. Any price and availability information displayed on http://www.amazon.com/ at the time of purchase will apply to the purchase of this product. The Croydex Severn 19.69W x 19.69H in. 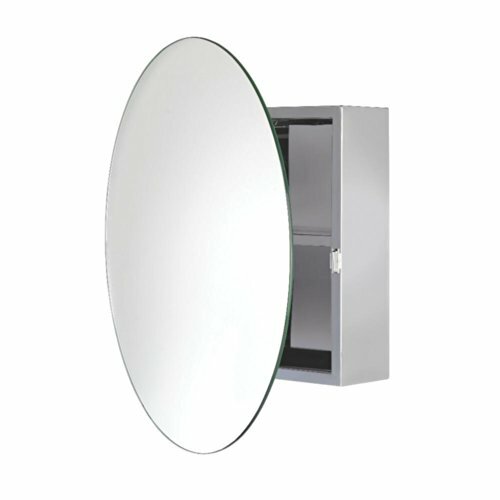 Surface Mount Medicine Cabinet has a charming oval design that fits in well with most modern decors. The cabinet can be installed as a recessed unit or a surface-mount piece as you desire. The cabinet frame is crafted from MDF and is finished with a stainless steel exterior. The door is fronted by a frameless, flat oval mirror and boasts a reversible hinge that allows for left- or right-hand opening (90-degree pivot hinge). The cabinet interior is divided by a fixed stainless-steel shelf, providing a wealth of storage in one compact area. The cabinet arrives completely assembled. All mounting hardware is provided. About Your Other Warehouse LLC Your ''Other'' Warehouse (YOW) is the premier master distributor serving kitchen and bath dealers and showrooms with more than 450,000 decorative faucets, fixtures, and accessories topped with best-in-class customer service. YOW's plan is simple: The company is absolutely committed to a standard it calls ''exactly right'' - exactly what you want, exactly when you need it, and exactly how you want to be treated. Dimensions: 19.69W x 4.33D x 19.69H in.. Cabinet hinge pivots 90 degrees. Handy storage solution ideal for small spaces. Fixed stainless steel shelf. Easy to install. Surface-mount only.